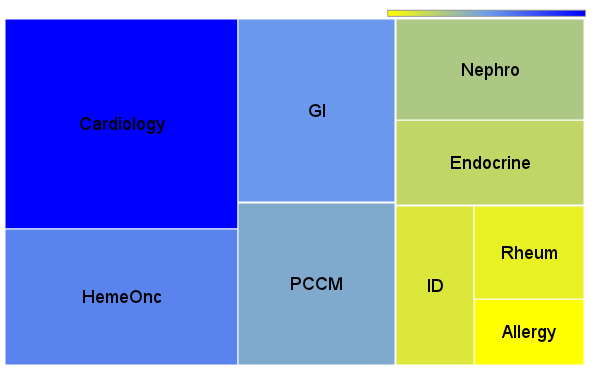 AIM: To ascertain which fellowships are most competitive for internal medicine residents after training. Data from fellowship match summary was selected pertaining to internal medicine fellowships and tabulated. The competitiveness of a particular field was calculated using ratio of [Number of applicants/Number of position]. When arranged and charted on the graph (figure 1), you can see that in 2012 the fellowship with the most applicants to positions offered was gastroenterology. The easiest fellowships at the current time to get into are Infectious diseases, followed by nephrology and then rheumatology. GI has always been a favorite amongst medicine residents. Whether this is because it is a procedure-based field has anything to do with the order of the result is a matter of open discussion. However, another procedure-based field like cardiology was lower on the list so that may not be the only reason. It may be that GI is more appealing because of better understanding of core concepts during training, more exposure during training and comfort of familiarity. It appears that ID may not be appealing to a lot of applicants (for whatever reasons) and so is nephrology. There is another aspect to this result. One thing that is not evident immediately is the number of positions that are offered for fellowships. The total number of fellowship positions accounted for in the above specialties is 3059. In 2009, there were 4922 PGY1 positions that were offered (The assumption here is that applicants who entered a graduate medical program in 2009 were ones applying for the 2012 fellowship position. There may be other factors and the assumption may be slightly incorrect but it’s the easiest one to consider). Thus one could say that approximately 2000 applicants chose to not sub-specialize after finishing their training. The proportion of applicants wanting to get into a sub-specialty is shown in figure 2. Thus in the coming years, as the number of applicants that apply to fellowship training increases and the number of positions remains unaltered, it is going to affect those specialties that have very few positions to being with. For example, allergy and rheumatology which have the fewest positions may end up becoming extremely difficult to get into. Bear in mind the results of the 2012 match discussed in above paragraphs are for all applicants. The story is very different if you do a selective subset analysis of international medical graduates applying to fellowships. 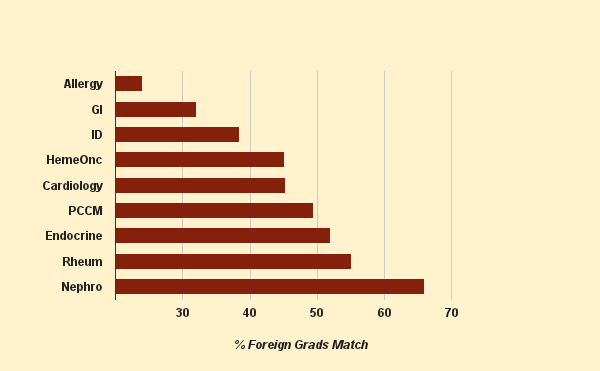 Figure 3 shows the number of non-US grads who matched into fellowship programs (No. of matches, all apps minus US grads). As seen in figure 3, Allergy/Immunology is the most difficult for international graduates to get into followed by GI and then ID. Towards the other other end of the spectrum Nephrology is the easiest for IMGs to get after medicine residency followed by rheumatology and endocrine. GI is the most competitive amongst all applicants for fellowship, while ID was least competitive. Highest proportion of applicants to fellowship sub-specialties were to cardiology and least were to allergy. 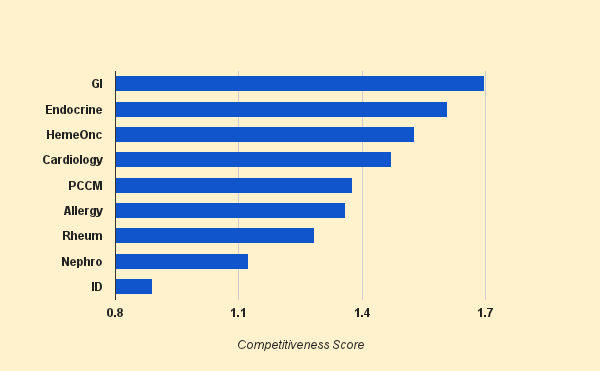 As number of applicants increases, the specialties with fewest positions (allergy and rheumatology) may see an increase in the competitiveness score. For international medical graduates allergy is most competitive while nephrology is the least competitive to get. Join me on Facebook or follow me on Twitter for latest posts and updates. Comments or questions in about me section or below each article. Scroll below ↓ for the most popular articles this week! Hello Sir, Thanks for your insights . This s really helping IMG's. I would like to know are there any fellowship programs which i can do after a non clinical MD from India.I have completed my MD in physiology. What are the options of future career in US after doing physio. Also I am interested in research as a career.